I CAN Run For Office! 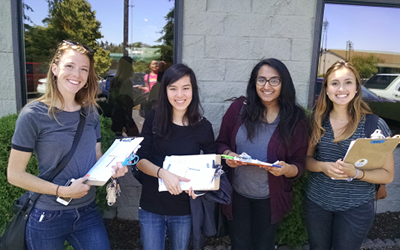 Here at Washington Conservation Voters, we work to elect environmental champions across the state and we are always looking to support new people interested in running for office. We believe there are incredible opportunities for community members who strive to protect the environment and fight for environmental justice to drive change in elected positions, from City Councils to the State Legislature. Get more information or nominate someone to run for office today! We realized something simple: Washington state needs more elected officials who really care about environmental issues and are willing to step up and champion environmental justice. To accomplish this, WCV is dedicated to lowering the barriers to running for office. That’s why we launched I CAN, a candidate recruitment and development program to provide the extra support needed to elect true environmental champions to office. Our goal is to elect more environmental champions to all levels of government in Washington state – and that could mean you! If you have stepped up in the past to knock on doors, make phone calls, attend community events, raise money for candidates, or vote, the next step might be running for office. Am I qualified to run for office? Effective candidates, especially those running for local offices, are simply people who care about issues in their community. If a few of these apply to you, you might be ready to run for office! I care about environmental issues. I am involved in my community. I know a thing or two about policy. I am a person of color, womxn, young person, or someone who’s identity has historically been left out of the political process. I often feel my current elected officials do not represent and reflect my community. I have experience in community outreach, government, or advocacy. How will you support me if I run for office? We know there can be daunting barriers to running for office and we hope that through the I CAN program, we can open up this process to more Washingtonians who are already environmental advocates and driving change in their communities. Ongoing mentorship and support: If you’ve ever thought about the possibility of running for office and thought you’re not qualified in the same moment, you are not alone. We want to invest in environmental advocates and give you the skills and information you need to feel ready and qualified. From connecting you to organizations to seek out endorsements to helping craft voter guide statements, WCV works alongside each of our recruited candidates. If you bring the passion and natural knack for engaging your community, we will bring the election expertise you need to be ready to run. Policy and skill building: We know that having passion for environmental issues does not mean you are a policy expert — and that’s okay. Part of our investment in candidates means that we will work with you to bolster your knowledge and brush up on environmental policy. Individual trainings: The most important part of being an effective candidate is engaging in the issues facing Washingtonians and your community. The details of being a candidate are teachable. We work with partners to provide opportunities to go through candidate training programs, work with you one-on-one, and do specific trainings on environmental issues. If you’re considering running for office now or in the future, or know someone who should, get in touch!